Checkout 51 just announced a huge contest! 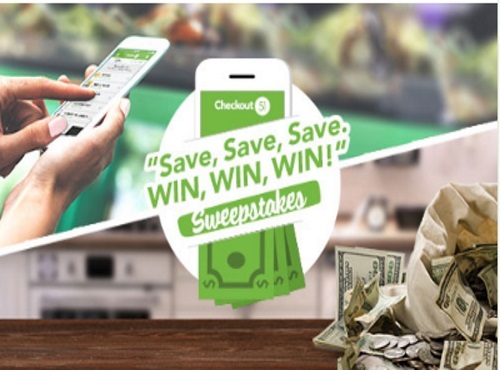 Starting May 18 until July 5 they are giving away $100,000 in their Sweepstakes! Redeem any offer this week from your offer list & you’ll be automatically entered into their weekly “Save & Win” Sweepstakes. Every week is a new chance to play. This week & every week up until July 5 they're giving away $12,500 in prizes to a few lucky winners. Their weekly Grand Prize is $2,500. So what are you waiting for, save to win! If you aren't a Checkout 51 member yet, you should totally join! Every week they have grocery rebates available, when you buy the items claim them on your app and you get cashback! I've redeemed over $100 in cashbacks since joining. Click here to browse this week's Checkout 51 rebate offers. Click here to join/browse Checkout 51.